When you visit Café Masala, you are immediately aware that this is a restaurant that dares to be different. Quality is the paramount consideration. Top quality food, professional service, and a top quality-dining ambience combine to make Café Masala an unforgettable experience. Unique has no equal. That is what Café Masala is to customers who are overwhelmed by our ever evolving cuisine. 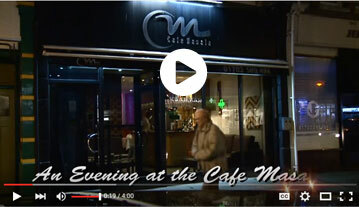 Café Masala is a team, providing unrivalled cuisine to discerning customers. Our experience and vision that create the ultimate in dining experience have been duly complimented by local support, press and Media coverage along many awards. Two specialist chefs with our team to bring you the best of Bangladeshi and Moghul cuisine.Diners at Café Masala can rest assured that only the highest quality products and genuine brands are served here. The restaurant has received 5 * star award certificate from Southend On Sea Borough Council's Health & Hygiene inspector which is proudly displayed on the door. At Café Masala we know the real sources from where to buy the best ingredients, so that the dishes served are second to none. Our head chef and his team are developing new recipes all the time, so that we do not rest on our laurels. Come and share our passion for excellence in cuisine, created with you in mind. Our restaurant is at the cutting edge of the industry. We are ceaselessly raising our standard to meet the desires and aspirations of our customers. Our reputation has been awarded the prestigious British Curry Award twice. Cafe Masala means that we use spices directly from the source. Cafe Masala means that we turn these spices into flavours. Cafe Masala means that we turn these flavours into dishes. Cafe Masala means that we turn these dishes into customer satisfaction. Cafe Masala means us. PLease click here for express Take Away orders.